Cinemusic: Do Couples Dream Of Electric Music? | Warped Factor - Words in the Key of Geek. Cinemusic: Do Couples Dream Of Electric Music? 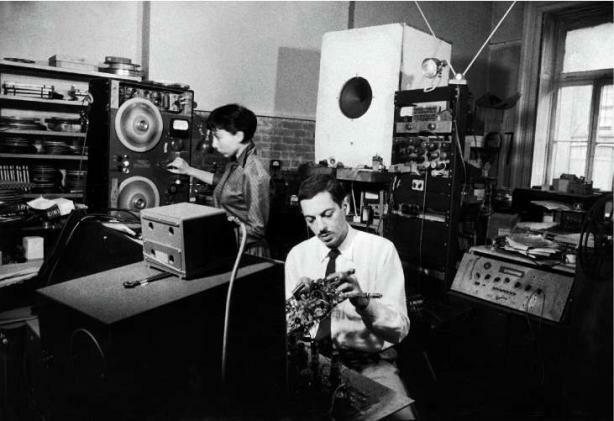 Chris Morley looks back at a couple who were at the forefront of electronic music. Pop & rock are littered with examples of married couples working together - perhaps most famously Paul & Linda McCartney in Wings or John Lennon & Yoko Ono. We could also add Thurston Moore & Kim Gordon of Sonic Youth & Jack & Meg White of the self explanatory White Stripes. Within the world of film scoring though, one such union trumps even these illustrious examples! They were the first to dream of electronic music as soundtrack material, & would do 1956's Forbidden Planet the honour of allowing it to act as the canvas for their experiments with the then relatively new medium & magnetic tape. Bebe & Louis Barron wed in 1947, among their wedding gifts a tape recorder which they put to good use in exploring musique concrete. They had both studied music itself - he at the University of Chicago, she in Minnesota. And within three years of marrying their first collaborative piece Heavenly Menagerie had premièred. After much work, presumably, as at the time editing of such would have required hours of physical cutting & splicing to arrive at a finished product....often burning out Louis's carefully soldered circuits in the process, Mr Barron serving as recording engineer & tech consultant while his wife got on with composition. "...it just sounded like dirty noise." Noise which could arguably have got them an Academy Award but for the technicality of not belonging to the American Federation of Musicians! Awards or none, they are often credited as the prime movers behind many now commonplace effects such as tape delay/ looping & reverb. On that Bebe would say in response to a question on whether they had in fact invented those. "I think we did. I never heard of anyone else doing it at the time. Then we had a voltage generator for varying the capstan speed, so we were able to shift the pitch. This didn’t work with our next deck, a stereo Ampex: we had to build up the capstan with splicing tape in order to vary the speed. Of course, we could play it at half speed also." They also predate the Moog synthesiser by a whole eight years, not inconsiderable in this particular electronic field. The studies of Norbert Wiener as published in 1948's Cybernetics - Or Control And Communication In The Animal And The Machine proved influential on their ground-breaking approach. As an Independent obituary for Bebe made clear. "These circuits, designed by Louis, "would exhibit characteristic qualities of pitch, timbre, and rhythm, and had a sort of life cycle from their beginnings until they burned out", according to the historian Barry Schrader. Bebe Barron manipulated hundreds of raw tape clips, "a terrible job", as she told a National Public Radio interviewer in 2005." Incredibly their work was only initially intended to act as a supplement to what most would have termed a more conventional orchestral score before the decision was taken to allow them to become primary composers. Though they didn't actually at first consider what they had slaved over to be music at all. The man who helped them change their minds was composer John Cage, with whom they had worked as sound engineers on his own projects, hailing as they did from the avant-garde. His own ideas were somewhat left of the dial. That concept of sound as an actor is something the Barrons would take into their own work on Forbidden Planet, which would be credited as electric tonalities by MGM to avoid having to pay musician's rates to the couple!